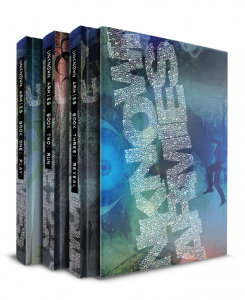 Caleb and I talked to Greg Stolze about his latest project, the third edition of Unknown Armies, a post-modern horror role playing game. Urban legends, obsessions, occult conspiracies, and the invisible clergy are all part of a compelling modern game. It is also a profoundly humanist game, where humanity is the center of the universe, not cosmic and unfeeling alien gods beyond our comprehension. Greg talks about changes to the setting, new mechanics for Unknown Armies and game design in general. If you are interested in checking out the game, I recommend backing the Kickstarter so you can read the latest draft of the game now. Unfortunately, we did have some recording errors, so some of the questions will have an echo. I tried to fix it in post but there’s only so much you can do. I knew reading all those Vertigo comics would proove useful someday! Also I can’t wait for an AP if only to see what happens to Aaron’s Character. I wish I could up my pledge but intl. Shipping is a bit much for me right now. As always, a great listen. Hearing Greg Stolze reintroduce the game gave me ideas on introducing it to my players, particularly the “getting into the club” analogy. I was already in for the Kickstarter, but the interview made me even more excited. Plus, it’s great to hear about a new UA novel in the works. Something I like about the new schools is that, while they’re less immediately self-destructive, several of them seem more flexible so they can support a lot of different character worldviews within that obsessive focus. And mechanically, A Dirty World + old UA sounds fantastic. I also like the use of Pacts. Reminds me of the similar system in Wh40k Black Crusade. K’lob, does your enthusiasm for this edition mean that perhaps Campaigns I Shan’t Be Running might be modified? I imagine it’s like the dials in the Apocalypse Engine games. I’d certainly love to give my “KC?” campaign a shot. The objective system puts me more at ease for not having quite the Powers-esque reading chops I thought would be absolutely necessary with older editions. But it all depends on A)whether enough of the RPPR crew wants to play, B)managing to schedule a game amongst our many other gaming responsibilities, C)winning a fight with Ross over who gets to run it first, and D) Red Markets giving me time to write anything besides Red Markets (which looks least likely of all). @Caleb I call dibs on an agrimancer for said hypothetical campaign so, so hard. Finally, my farming background will be relevant to gaming in a way that doesn’t involve Agricola. I’ve been reading about Gnomon. I can’t wait for the Flash Mob/ Person of Interest bs you’ll put Aaron through to get charges. I’m making assumptions of course but giving A-a-ron a robot friend never ceases to entertain.